Cambodia is a backpacker’s paradise. Not only are there plenty of things to see and do, but the beer is also cheap and so are the beds. Staying in a 5* hotel might be some traveller’s idea of heaven, but if you’re out every day exploring a new country, why waste money on an empty space? Looking at staying in budget hotels in Cambodia can give you extra cash for your adventures. It can also mean that you get a more unique experience than if you were to stay in a standard hotel room! Plenty of images to look at – you could take our word for it but looking at pictures yourself is always better! Some of the hotels also offer other rooms at a higher rate, but they’ll still be pretty low priced. Don’t forget that prices can fluctuate depending on your dates, so if you can be flexible then you’re more likely to catch a great deal! So, if you see a great hotel offering a dorm bed for £3 but you’d prefer to have a private room, still check it out because the chances are that there will be something for you at an amazing price. How much does it cost for a hostel in Cambodia? How much does it cost for an A/C room in Cambodia? How much does it cost for a beach bungalow in Cambodia? What is a good budget in Cambodia? How much are the cheap hotels in Cambodia?. Smack bang in the middle of the city, you can check into Sla Boutique Hotel at any time of the day and even dine at their in-house restaurant. There’s a lounge bar where you can chill out with a drink before heading out into the city. You’re only a ten-minute walk away from everything here, which means it’s a great base for a few nights’ stay. Not a party hostel, Sla Boutique has gained its reputation for being clean and cosy, with a wonderfully friendly staff! Fancy a drink overlooking the city? Then head on up to the rooftop bar and take in the amazing views of Phnom Penh. Feliz Hostel Café and Bar also offers bicycle hire for you to explore the city at ground level. Phnom Penh airport is only 11km away so if you fly into Cambodia and stay here, there’s not much travelling to do once you land! Bunks have a privacy curtain and a plug, or if you’re looking to socialise, there’s also a large outdoor screen to watch some sport on. If you’re looking for one of the more relaxed and cheap budget hotels in Cambodia, then you’ve found the right place. Usually, looking for budget hotels in Cambodia limits you to a room and a shared lounge. At Onederz Sihanoukville, not only do you get a bar, kitchen area and terrace to spend your time in, you get a fantastic pool too! It’s never going to get truly cold in Cambodia, so whatever time of year you visit, you’ll always want to jump in. If a pool is not for you, then you’re only 600m from Serendipity Beach. Each dorm room has a shared bathroom, air conditioning (a lifesaver!) and private lockers. Check in at the 24-hour desk and ask them about tours of the local area too. Situated near the stunning and quiet Otres beach, Ta Kloy Tip offers everything for those of you who want to get back to basics and enjoy a peaceful stay. The bungalows – yep, not just a bunk bed this time! – offer a beautiful view of the garden and pool from the entrance. You get a private bathroom, air conditioning and a flat-screen TV too. You can hire kayaks and bikes, or just lie in a hammock and let the laid-back vibes wash over you. Ask the Ta Kloy owners anything too – they’ll give you the best insight into the local area and make sure you’re well looked after! If you’re looking for a quiet place to unwind in Siem Reap, then look no further than the Mudra Angkor Boutique Hotel. Treat yourself to a massage or a swim, if you can tear yourself away from the rooftop terrace views on the city, that is. You can eat breakfast here too. There are plug sockets and personal lights for each of the bunk beds, and every room has air conditioning. If you do want to venture into the bustling town, you’ll only have to travel 2.3km to get to Pub Street – it’s far enough away to get a good night’s sleep but it’ll only take you a few minutes in a tuk-tuk to get there! You won’t even have to pay for a tuk-tuk ride into town – this hotel offers them for free! At the Pool Party Hostel, you can enjoy a cocktail from the swim-up bar, bike hire and a great social vibe for people who want to get to know their fellow travellers. There’s a restaurant on-site, but if you fancy a change then it’s only 1.2km from Pub Street. The dorm rooms all have air conditioning and safety deposit boxes, so you’ll be able to sleep well. Friendly staff make all the difference too – ask a question or organise a tour or a cooking class, and they’ll be more than happy to help you out. Being only 7 minutes from the Kampot night markets, Borey Vatanac Guesthouse is in a great location if you’re wanting to get out and explore Kampot. If you can push your budget then I would upgrade to an AC room, it’s a decent price compared to other AC rooms in Kampot. Like so many hotels in Cambodia, Borey Vatanac Guesthouse can arrange tours and excursions in-house so you won’t have to brave talking to street vendors, who might rip you off. What better way to wake up than with a view of Cambodian mountains? At the Sabay Beach hotel, that’s exactly what you can do. Sit on the sun terrace and take in the scenery, hire a canoe or even relax with a book from the library. If you’re more of a swimmer, head outside and spend all day at the soft sandy beach. Each dorm room has a garden view, mosquito net and even a drying rack for your clothes. You’ll even receive free toiletries here too! There’s a restaurant here serving excellent food – if you have a special dietary need they’ll be more than happy to try to accommodate you too. Often, staying at budget hotels in Cambodia means that you’ll be sharing with other people. Here you’ll be able to stay in a private double bungalow for the price of staying in a shared dorm elsewhere. Only 2.6km from the famous Crab Market, grab a free bike and cycle the short distance. You only have to look at the pictures for these bungalows to see that beauty is the aim of the game, the bungalow grounds are covered in flowers and plants. If you get bored of the views from your bungalow then have a look at the incredible views of the Kep foothills and national park, if you get bored with that then you’ll get bored of any view! You’ll be able to walk to famous crab markets or the city centre in only 5 minutes if you stay at Bacoma Bungalows, so you won’t have to fork out for a tuk-tuk during your whole stay in Kep. The staff can organise all tours, excursions, rentals and offer general advice about the local area. There is a bar and restaurant on site so when you’re feeling lazy you won’t have to go far to get a beer. Lastly, I love the look of these unique little bungalows and I reckon you will too. Such a good location at such a little cost. If you have been looking for cheap hotels in Cambodia then you’ll also be looking at how to get around Cambodia, spending as little as possible. I have a few tips on how to save money whilst travelling Cambodia so have a read. When you approach a tuk-tuk driver, they will offer to take you for an extortionate price. If you just say no straight away and offer a much smaller price, they usually just say ok. This is because every now and again someone says ok to the crazy price. This means that all of the tuk-tuk drivers just play their luck to see if you’ll agree. Just be firm with your no and if they persist walk to the next tuk-tuk. Cambodia has a very good street food scene. You could go into a restaurant and literally buy the exact same thing you could buy on the street for triple the price, or more. Do yourself a favour and eat on the small plastic chairs and picnic tables scattered throughout the country. this will save you heaps of money and, personally, I think the food is better anyway. Don’t ever book a tour through someone on the street, you will either get ripped off or the tour will be absolutely rubbish. I recommend booking in advance through a company like Get Your Guide as they are reputable and they have a very good customer service record. If you don’t like booking in advance then I highly recommend going through your hotel to book tours. This is because the hotel has a reputation to uphold so will usually endeavour to put you on the best tours. If you’re not dependant on Wi-Fi, then visit the absolute gem that is Koh Ta Kiev. We haven’t included it in our full list because there is no Wi-Fi on the island at all – that sometimes scares people off! But if you’re looking to get off the grid and experience true island life, then Koh Ta Kiev is the place for you! If you book hostels and eat street food then you can, pretty easily, live off of $15 a day per person. You can get nice rooms with A/C, bathroom and Wifi from $3 – $15, depending on dorm room or private room. Have we convinced you that there are some amazing places to stay in Cambodia on a budget yet? 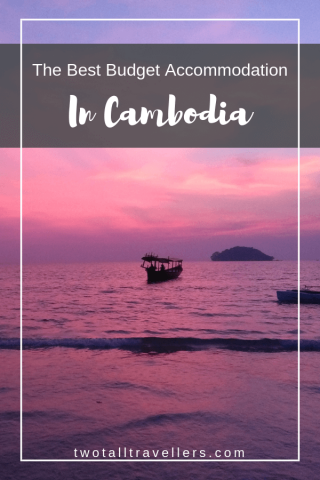 Check out this comprehensive guide to Cambodia and book as soon as you can! These prices won’t stay so low – guarantee your rooms before it’s too late! Fab list Jade! We visited virtually all of these towns, which is neat. It was by no means budget, but the Rijitikitavi hotel in Kampot was one of the best places we ever stayed in, during our 6 years on the road. Well worth the price as the staff was incredibly fun, generous and helpful, and the ambiance out of this world. Thanks for sharing these budget friendly digs with us. Cheers Ryan! I might have to have a look at this hotel if its as good as your saying. I have only been to Siem Reap and Sihanoukville, so I will definitely go back one day to Cambodia! Super useful article for the day I will 🙂 Thanx a lot! Thanks very much. There’s so many hidden gems in Cambodia. I reckon we will go back one day too.